Another experiment from the mad scientist studio of Create Art Every Day. This was my first try playing with an acrylic texture product by Golden called clear tar gel, and I thought it might be cool to add watercolor paint. The acrylic gel acts as a resist to watercolor paint, and in this case, kept the different pigments from blending with each other and making mud. It drips from the jar in strings like honey. It goes on white, so it’s easily seen, then after several hours, it dries clear, masking the surface beneath it. I started with white 140 lb. watercolor paper in this case, dripped the tar gel on in a random pattern of squiggles, let it dry overnight, and then added watercolor the next day. While preparing this post, I came across this blog post, which has lots of ideas for using clear tar gel too. 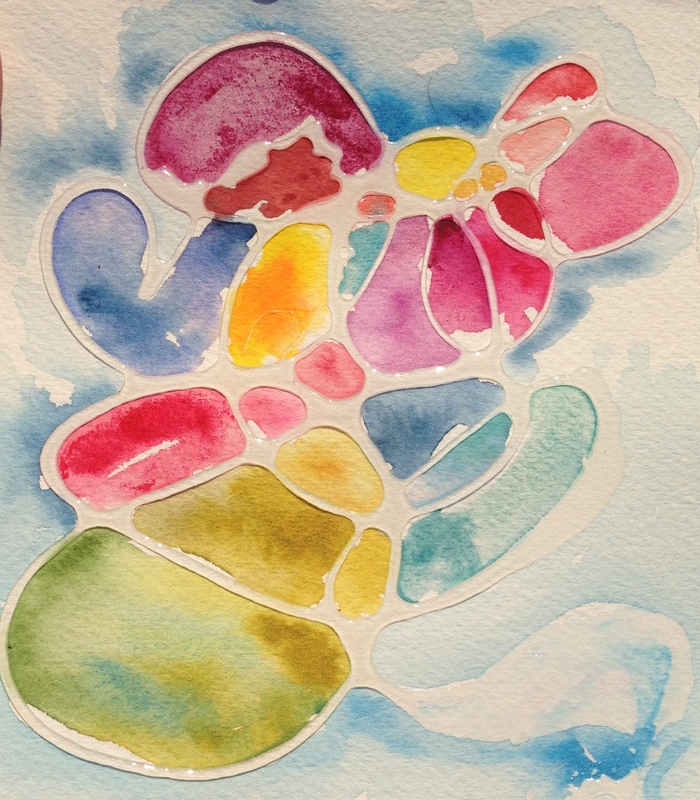 I hope this inspires you as we prepare for World Watercolor Month in July! Happy Father’s Day to all of the wonderful men who make this world a better place by being amazing dads. I’m off to the kitchen to make gluten free crab cakes for Hub for later. Peace and happy painting to all! I was wondering what to do with that but haven’t investigated yet. Will follow you link later. Thanks for sharing!! And your painting is fresh and lively!! a colorful doodle anyway! 😀 Thanks, buddy. Looks like a pretty flower. Thanks, Laura – that’s how I interpreted the squiggle too! hehe fun to find things in abstract squiggles. Awesome information, and love your painting Laura. Ohh, so cool! It looks like stain glass! I wonder what will happen next?! Wow – cool stuff, Laura. Do you leave the gel on? Or do you peel it off later? This would be cool to use with blocking out foregrounds so one can do backgrounds. Thanks, glad you like it! I don’t think it would peel off easily – would probably mess up the paper. I’m thinking about doing a background wash in acrylic and then once that dries, it won’t move – then go over with wc. If I were a more talented painter, I could put these ideas to better use lol. Thanks Steven! It’s like a playground over here 😀Glad you enjoyed it! I imagined a laboratory with organ music in the background. 😉 No, a playground sounds about right. It really does sound like a lot of fun. That’d be cool too! Thanks Lucy! Thanks, Mary. 😀 It was fun to do. Cool stuff, one of these days Ill give it a try. I love your random pattern of color. Happy day to you, Laura! Thanks Sharon, fun to experiment! Happy Monday to you! The tar gel sounds a bit like Liquid Frisket. Have you used the latter? If so, how do the two compare (besides the fact that Frisket will rub off and tar gel won’t)? Your painting is so fun and fresh! ❤ I guess that comes of knowing you're experimenting and not trying to produce anything specific? I have frisket but haven’t used it, Teresa. The smell turned me right off. I think CTG is used mainly by acrylic artists to get various textural effects, but I wanted to test its resist properties with watercolor. Also looking into mixing the two mediums within one painting and wanted to see what it would do. Plus, I’d never used it and wanted to play! CTG dries shiny and clear, so that’s one obvious difference, based on watching other artists use frisket. And you can mix acrylic paint with it to achieve colored textural effects as well. So I can see it being used in multiple ways. Definitely not so utilitarian as frisket is. Thanks for the explanation, Laura! Sure! I hope it helped. You mad scientist you! I love how you jump right in! Your painting reminds me of a stained glass. I now want to start experimenting, I actually painted four paintings today! I did wash one away but it was part of an experiment because I am going to re-use the paper. You are like a mad scientist however I enjoy reading about your experiments. Those crab cakes sound nice! Maybe thats why I’m so enthusiastic! It’s pretty much all new! I feel like a kid in a sandbox! I found it offputting too lol but it was lots of fun! If you’re into acrylics and felt like mixing some metallic acrylic in for a textural add to any painting, I think that would be cool. Or any acrylic, really. Fun! so greta to follow all your experiments!! I love this! Thanks, Johanna! Glad you enjoyed it! What a joyful explosion of color Laura – sweeeeet! Thanks, Deb! Glad you enjoyed! I’m thinking metallic acrylic and clear tar gel on top of an abstract painting – what do you think? Have you ever tried it or colorizing it? Nope, but go for it, looking forward to the results!